A huge cloud of hydrogen surrounded Comet Hale-Bopp when it neared the Sun in the spring of 1997. 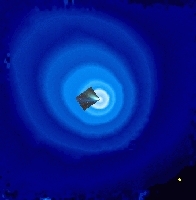 Ultraviolet light, charted by the SWAN instrument on the SOHO spacecraft, revealed a cloud 100 million kilometres wide and diminishing in intensity outwards (contour lines). It far exceeded the great comet's visible tail (inset photograph). Although generated by a comet nucleus perhaps 40 kilometres in diameter, the hydrogen cloud was 70 times wider than the Sun itself (yellow circle to scale) and ten times wider than the hydrogen cloud of Comet Hyakutake observed by SWAN on SOHO in 1996. Solar rays broke up water vapour released from the comet by the warmth of the Sun. The resulting hydrogen atoms shone by ultraviolet light invisible from the Earth's surface. Even a satellite's view of the Hale- Bopp cloud would be spoiled by hydrogen around the Earth. Stationed 1.5 million kilometres out in space, SOHO had a clear view. SWAN is the brainchild of Jean-Loup Bertaux and colleagues at the Service d'A[e/]ronomie du CNRS (France) and the Finnish Meteorological Institute. Tuned to see hydrogen, SWAN scans the sky and studies the solar wind's effect on hydrogen atoms coming from interstellar space. Comets reveal themselves as local sources of hydrogen. With SWAN's maps, Michael Combi of the University of Michigan studies gas outflow from comets. He also uses the Hubble Space Telescope, but that instrument cannot safely look at comets near the Sun. The unique SWAN observations of Comet Hale-Bopp imply that the outflow of water vapour peaked at almost 50 million tonnes a day.